Support your local independent bookstore: buy it there! Review copy provided by the author. Content: There is some challenging language, because it’s set in medieval times, but with the large print, short(ish) length, and illustrations, a younger kid/reluctant reader could enjoy it. It’s in the middle grade (grades 3-5) section of the bookstore. 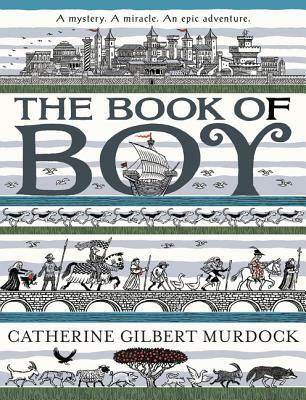 Things that surprised me about The Book of Boy: How religious it was (though I don’t know why that did; it’s set in 1350 in Italy, and religion was a huge part of everyday life), how much I didn’t mind it’s religious nature, and how charmed I was by Boy and the pilgrim he went on a quest with. Things I’m unsure about: the speculative(ish) element of it. See, Boy is a humpback child, and was told to keep his hump covered and hidden and never touch it. He’s shunned because of this — this felt “true”, even though I don’t know if people who didn’t look whole were shunned, but that’s what stories have always led me to believe — by everyone except a wayward pilgrim on a quest to collect the relics of St. Peter. But, once on the quest, Boy discovers that his hump is not an ordinary one, which is a blessing and a curse. Things I really enjoyed: I loved the narrative style of the book. I think Murdock caught the inner voice of this naive character, who was doing what he was supposed to, and unsure about his own future and any changes. I loved that Boy could talk to animals, and that the animals helped him when he needed it. And I really enjoyed the whole quest: there were challenges along the way, and both Boy and the pilgrim needed each other. It was very sweet and charming.